TANDAG CITY, Surigao del Sur, Philippines – They share the same name. They share practically the same struggle. Among some 3,000 Lumads seeking refuge at the Surigao del Sur Sports Center, there are two mothers of nearly the same age named Maribel Enriquez. Both seek justice for the plight they are going because of the military. Just below the big signage that read Surigao del Sur Sports Center, Bulatlat.com chanced upon the first Maribel Enriquez, 26, who was breastfeeding her five-month-old baby in the afternoon of Sept. 7. She was sharing some light moments with her fellow evacuees and her big smile painted an irony to the dire conditions at the evacuation site. “Buhay na namin ang pagbabakwit. Dito lang kami nabubuhay,”(Evacuating has been part of the course of our lives. This has been how we have been living.) Maribel said. This is the fifth time that the 26-year-old mother had to forcibly evacuate from her home to flee from military operations. Each time was no different. But in recent years, adjusting to the life as a “bakwit” has become more difficult with three children in tow in the evacuation site. The evacuation site is hot and humid during the day, with occassional light rains in the afternoons. But from evening to dawn, evacuees endure the biting cold. Evacuees did not bring enough clothes with them as they packed their things in haste. They sleep on the concrete bleachers covered only with flattened cardboard boxes. Despite the harsh conditions in the sports complex, Maribel said she would rather endure it than face the soldiers and members of Magahat-Bagani, a paramilitary group formed and armed by the military to supposedly hunt down members of the New People’s Army (NPA). But civilians are the ones who suffer from their atrocities. They branded their fellow Lumads as either members or sympathizers of the NPAs. They redbaited the Tribal Filipino Program Surigao Del Sur (TRIFPSS) and Alternative Learning Center for Agricultural and Livelihood Development (Alcadev) as “NPA schools.” But the worst came last Sept. 1 when they killed two Lumad leaders, Dionel Campos and Datu Juvello Sinzo, and Alcadev executive director Emerito Samarco. 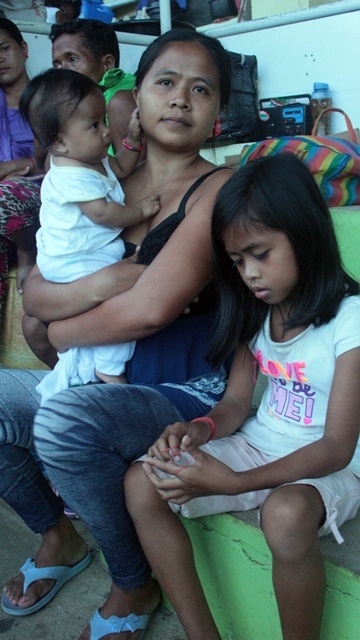 Maribel and her children were among the hundreds of residents gathered at the village basketball court who saw the paramilitary men shoot and kill the two Lumad leaders. She also heard that Samarca was detained in Alcadev alone, only to discover later in the morning that he, too, was killed. “The children saw the killings. They kept on crying until their lips seemed to have been drained out of blood. I did not know what to do. I was also shocked with what I witnessed,” she said. Maribel found it hard to understand why the Lumads had to lose “good people” like Campos, Sinzo and Samarca from mere allegations that they were members or sympathizers of the NPAs. “I do not understand why they had to kill them. Most importantly, I do not understand why they had to do it in front of us and our children,” she said. She said children would cry whenever they see people wearing camouflage uniforms as these reminded them of the members of the paramilitary group who killed their Lumad leaders and educator. Maribel, a former student of both TRIFPSS and Alcadev, thought it was their end. The images of their two Lumad leaders being killed in front of their very eyes would flash in her mind once in a while – a memory that would be difficult to forget for the rest of her life, she said. In a television interview last week, Armed Forces of the Philippines spokesperson Col. Noel Detoyato denied that the Magahat-Bagani is connected with the military. He did not directly answer when pressed if the military had previous clashes with what he referred to as “criminals.” Instead, he said there were reports that members of the paramilitary group were at times seen in military camps and, if proven true, they would hold to account ranking officials in the area. Maribel said the attacks against their school is an attack against the entire community, whose children are educated there. The nearest government school is about 16 kilometers away. “I have learned so many things there. I learned how to plant vegetables and how to make the land productive. The lessons we learned were very practical and could be applied in our everyday lives. My favorite subjects are history and values education,” she said. Later, her thoughts drifted to their vegetable patch. “Maybe (soldiers) already destroyed it as well in the same way it burned down our cooperative store,” she added. The second Maribel Enriquez did not wear the same smile nor rage of the other Maribel. During the entire interview, she seemed to have spaced out, answering curtly to questions. For her, the killings did not end at Han-ayan. She lost her four-year-old daughter Reynabel to asthma due to the extreme weather conditions at the sports complex. Maribel, who hailed from Magkahunaw, Buhisin village in San Agustin, recalled how her daughter was still playing and dancing the night before she died. She was surprised to find her no longer breathing at around 3:30 a.m. last Sept. 8. Her daughter was rushed to the nearby Adela Serraty Hospital, where she was declared dead on arrival. The remains of Maribel’s four-year-old daughter Renabel replaced Samarca’s in the provincial social hall when the latter was moved to Butuan City, a day before his burial. Renabel was laid to rest along with the two Lumad leaders in Diatagon village last Sept. 13. After the interview, she wept as she listened to her sister-in-law Belinda Eda, 58, voice out in tears the struggle that their family and the rest of the Lumads are going through. “We do not have much money. But we have enough food to eat because of the crops we plant. We are not happy with what the military has done to us,” she said, referring to the dire situation in the evacuation site. It is clear to both Maribel and Eda that the attack against the Lumads is part of the government’s counterinsurgency program Oplan Bayanihan. Maribel said the government’s way of “helping” is to kill them. The mere “sundang” (bolo) they used for their farming is seen by the military as weapons against the government, she added. “Once a civilian is suspected (to be a member or supporter of the NPA), they would immediately kill that person,” she said. The two Maribels, may not know each other or have blood relations,. But their pain, sufferings and hopes remain very much alike. There is no bio available for this author. Previous PostUtica College’s Tuition Drop: Philanthropy or Survival?